Game Online: Violent or Sporting? Viet Nam's Game Online (GOs) makers have introduced three new violent GOs causing a lot of potential worries rather than "good news" like they advertised. 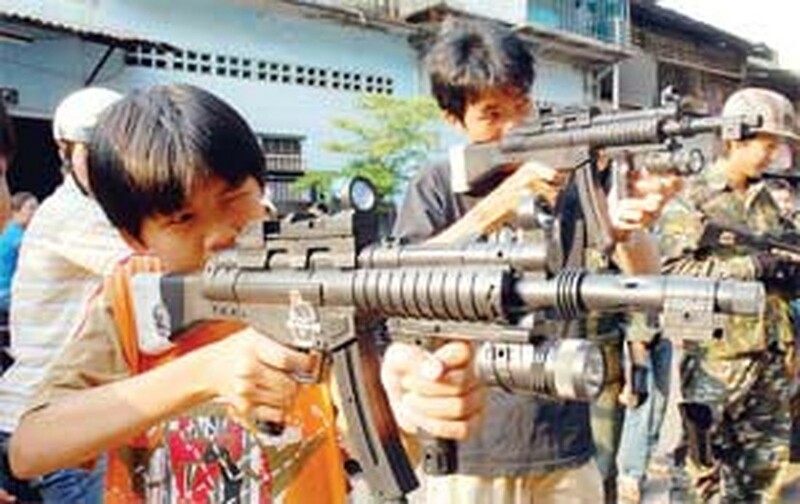 Children play Special Force game at Bac Hai Quarter, in HCM City's district 10. The image is considered very terrible for Vietnamese society and must be banned. All three GOs are role-playing games and participants assume the roles of fictional characters, such as a terrorist or a police and collaboratively or individually fight against each other. The FPT Corporation presents Special Force as a combat where the gamers can all use modern weapons, including rifles, submachine guns, grenades and handguns to achieve victory. VinaGame, after buying the copyright of the South Korean GO Sudden Attack, quickly promoted some hot spots of this new GO, including an outstanding graphical interface and a live action role playing environment. After shooting at an enemy with an AK-47U assault rifle, the gamer can feel strong recoil. Despite the GOs makers advetisement, public raises their voice in negative impact of the games. Killing and bloodbath in the games may affect on children and make them turn into killers like in some countries. “A gamer nicknamed “Bong” wrote on a GO forum: “I’m so lucky to live in a country which has prohibited selling weapons like Viet Nam. But I worry that GOs promoting killing may be impressed on gamers' thoughts and cause serious effects. Many people are also worried that officials do not have any system to censor and rate the ages of gamers for the various GOs. Some games are banned for children below 16 years old in developed countries, but not in Viet Nam. In Viet Nam, a 6-year-old child can easily find a violent GOs and live the part of a terrorist in a game. A recent Sai Gon Giai Phong report requested officials to be more strict in censoring scripts of new GOs before they are published.